The survival game is a fun way for pupils to gain knowledge of the various dangers that a wild animal faces. 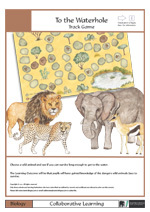 The game has four animals for the pupils to choose from but they can also make their own. There are also four Fact Cards for the pupils to record any information that they have researched during the course of this game. With TalkingPEN it is possible to record instructions and information and you can also translate the Game Cards into other languages.Learning Outcomes: Pupils will have gained knowledge of the dangers wild animals face to survive. The Weather is a topic of interest the world over, especially with he effects of climate change. 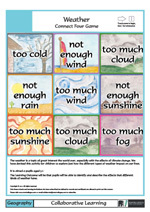 We have devised this activity for children to explore just how the different types of weather impact our lives. If you add different weather cards please send them to the address below for expanding our library.Learning Outcomes: Children will be able to identify and describe the effects that the different kinds of weather have. If you are a subscriber of the Collaborative Learning library (£110 membership with a FREE PENpal with labels and software) then you can download the pdf free of charge and print out. But frankly it is cheaper to buy the pack: all prints are made on cards, cards are sound enabled for PENpal adding an extra dimension of narration, in English and other languages, to the activity. All pictures are illustrated by artists. Game boards are laminated, Playing cards are perforated to give a square edge.The whole package not only looks highly professional, but will last much longer. Every component are stored in an accompanying sealable plastic bag.Each activity can be in other languages using shared audio files for PENpal. So, a Polish teacher or Polish speaking Buddy or a Polish EAL co-ordinator can translate key words and rules in Polish and upload their version for others to share with the FREE ShareLINK software that comes with PENpal. If you have bought the activity then you can also play in in Polish or any other language. Click here to find out more about ShareLINK. We have concentrated here on animals that can be found or sighted in English woodlands. If you have very different animals in the woods or forests in your area then you can add and subtract cards. If you add different sets of animals please send them to the address below for expanding our library. This activity can be played alongside the ’Who Eats What? 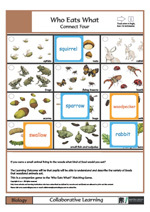 Matching Game’ to give pupils a greater understanding of the food chainLearning Outcomes: Pupils will be able to understand and describe the variety of foods that woodland animals eat. 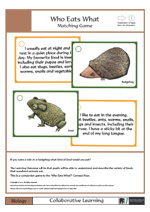 They can narrate their findings, describing the animals, insects and birds and their diet and habitats. We have concentrated here on animals that can be found or sighted in English woodlands. If you have very different animals in the woods or forests in your area then you can add and replace cards. This activity can be played alongside the 'Who Eats What? 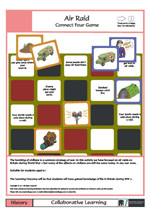 Connect Four Game' to give pupils a greater understanding of the food chain. The bombing of civilians is a common strategy of war. In this activity we have focused on air raids on Britain during World War 2 but many of the affects on civilians are still the same today, in any war zone.Learning Outcomes: Students will have gained knowledge of life in Britain during WW 2.